The new Visual Arts Building on the University of Iowa campus is a Steven Holl inspired award-winning design that provides 126,000 sf of loft-like space for the departments of ceramics, sculpture, metals, photography, print making and 3D multimedia. It also includes graduate student studios, faculty and staff studios and offices, and gallery space. The Visual Arts Building has an industrial aesthetic with 38,000 square feet of Rheinzink-cladding and poured-in-place concrete walls. The elevations on the southwestern and southeastern sides of the building are covered in 1.5-mm perforated stainless-steel panels, which comprise a rainscreen exterior envelope. The Rheinzink panels, as well as the stainless steel panels, were custom designed, engineered and fabricated by Pohl Group. The perforated stainless steel panels bring natural light into the building through a series of scooped setbacks with 13,000 holes in a specific pattern in each of the stainless steel perforated panels. AWS shop-assembled the channel glass as 10- to 12-foot-wide frames and set the pre-assembled units at each of the 23 terraces. The Fred & Pamela Buffett Cancer Center is establishing a commitment to collaboration where the world’s best doctors and researchers ask questions, share ideas and find answers that profoundly improve patient outcomes. Here, science and medicine will align in new and uncharted ways. We will bring together elements that aren’t commonly associated with cancer care, including music and fine art, meditation and yoga. Our team will aggressively work to cure disease of the body while recognizing the human mind and spirit play an integral role in the healing process. This integrated approach to medicine will help patients and their families deal with the challenges associated with cancer in an atmosphere that breeds hope, optimism and resilience. ​The new patient tower for the University of Missouri presented a compilation of unique challenges for HOK Architects. 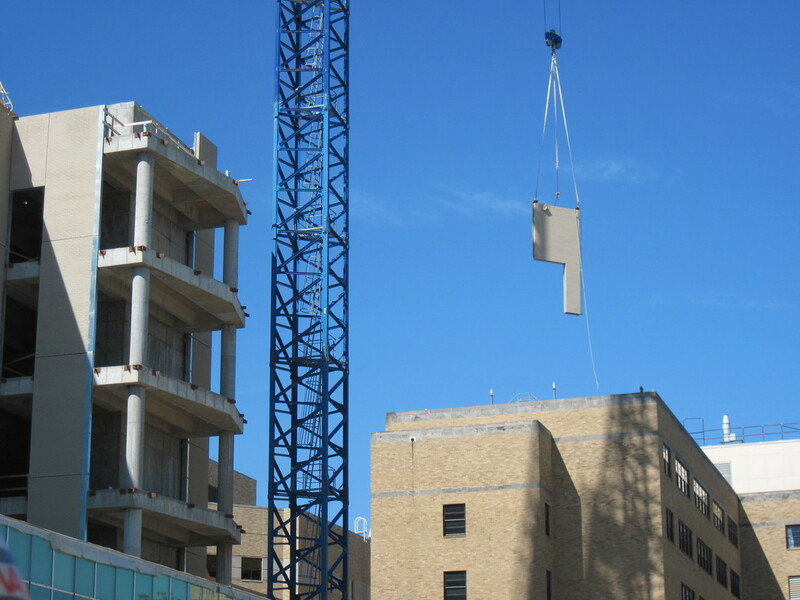 Based on site logistics and existing facilities, a full bed-depth brick veneer solution utilizing a unitized rainscreen system was the solution of choice. The Issue: No one had previously engineered or constructed this type of envelope in actual practice. AWS and SMI worked in collaboration with HOK's design team to develop a custom solution for the exterior envelope. Utilizing a design-bid-build delivery system, JE Dunn provided construction management services for the facility. Fully assembled in Strawberry Point, IA at the warehouse facilities of Seedorff Masonry, 324 panels were fabricated and shipped to Columbia, MO where AWS team erected the panels on the structure. 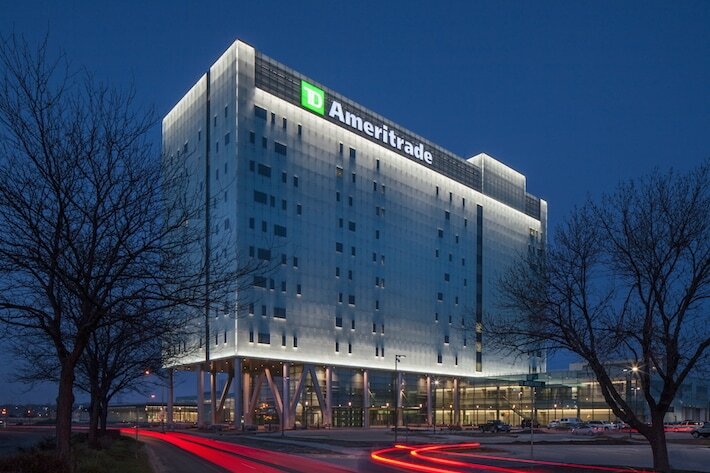 TD Ameritrade headquarters houses 1,300 of the online brokerage's 2,000 metro-area employees, with the remainder in a cluster of buildings across the street. The offices make extensive use of energy-efficient lighting, solar power and water conservation techniques. The building is one of the most energy efficient and inspirational office towers in America and it sets a new standard in capturing rainwater for later use and utilizes solar power to heat it. Construction began in July 2010 under the direction of HOK Architects with Omaha's Kiewit Building Group as the general contractor. Based on the efficiency of the design, TD Ameritrade estimates that annual operating costs decreased by 50 percent.